Two NASA astronauts have challenged the citizens of Earth to an otherworldly game of chess. Greg Chamitoff and Greg Johnson launched Monday (May 16) toward the International Space Station aboard the space shuttle Endeavour. They're plotting their moves from orbit over the next two weeks, in a competition facilitated by the United States Chess Federation (USCF). Regular Earthbound folks can suggest or vote on moves at the USCF website, though the federation will ultimately decide how to respond to the astronauts' gambits. NASA and USCF will use Twitter and Facebook to notify participants about the status of the game and when to vote on moves. "Chess is a great game that challenges the mind and helps young people develop critical thinking skills that will serve them well in math, science, and all aspects of their future careers," Chamitoff said in a statement. This game marks the second Earth vs. space match put on by NASA and the USCF. 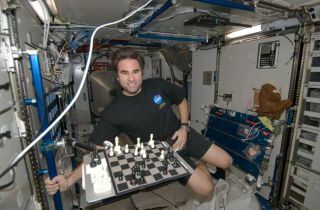 The first, back in 2008, pitted the world against Chamitoff, a chess aficionado who was living aboard the International Space Station at the time. Chamitoff lost, felled in part by the slick moves of the chess club at Stevenson Elementary School in Bellevue, Wash.
Chamitoff had brought his own chess set with him to the orbiting lab on that 2008 mission. He took a different set with him this time around, perhaps trying to change his luck. Having Johnson on his side for this match can't hurt, either, though the two astronauts will still be sorely outnumbered. "We hope to do better in this Earth vs. space match," Chamitoff said. "But, I have to admit, it will be a challenge, because we have an extremely busy flight ahead of us." During their two-week stay at the orbiting lab, Chamitoff, Johnson and their four crewmates will deliver and install a $2 billion astrophysics experiment called the Alpha Magnetic Spectrometer, which will hunt for dark matter, cosmic rays and antimatter galaxies. Endeavour is also hauling up a host of supplies to help outfit the station for its future years.